Joel Schildbach is a professor of biology and the vice dean for undergraduate education for the Krieger School of Arts and Sciences. 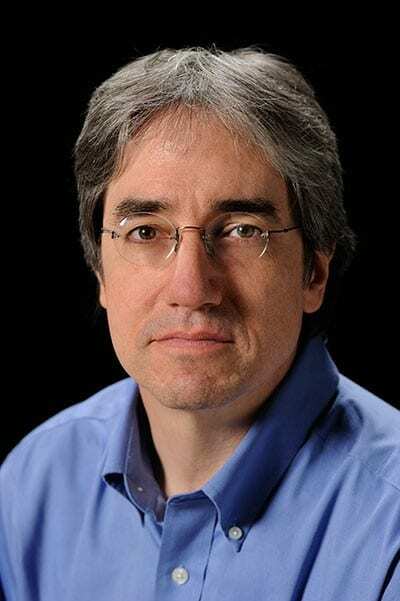 He graduated with a BA from Oregon State University and a PhD from Harvard University, and then did his postdoctoral work at the Massachusetts Institute of Technology. Bacterial conjugation, transfer of a plasmid from one bacterium to another, accelerates diversification of prokaryotic genomes and serves as perhaps the most important conduit for transfer of genes encoding antibiotic resistance and virulence factors. Yet despite its biological importance, our knowledge of conjugation at the molecular level is incomplete. By exploiting a variety of biophysical and biochemical techniques including X-ray crystallography, NMR, fluorescence spectroscopy, and in vivo fluorescence microscopy, we intend to describe the various steps in this complex biological process, attaining atomic resolution wherever possible. The information we obtain will enable us to better understand the function, organization, regulation and structures of the macromolecular assemblies that carry out this process. During bacterial conjugation, plasmid-encoded Tra proteins direct transfer of plasmid DNA, in single-stranded form, from a donor to a recipient cell. For F plasmid of E. coli, the first identified of the conjugative plasmids, the process initially involves expression of pili by the donor bacterium. The pili adhere to recipient bacteria and, through retraction of a pilus, the donor and recipient come into contact, eventually forming a stable “mating pair”. Plasmid DNA in the donor is nicked, unwound, and separated into single strands. One strand is transferred to the site of contact between the cells and transported across the membranes into the recipient. The DNA in the recipient is circularized, and complementary DNA strands are synthesized in both donor and recipient. While the F plasmid tra genes have all been sequenced and the system thoroughly studied on the genetic level, considerably less is known about the biochemical or structural basis of the activity of the Tra proteins. Our current focus is the DNA nicking and initiation of transfer of F plasmid. The TraI protein and its two activities, as an ssDNA transesterase or "relaxase" and as a helicase, are central to the process. TraI does not act alone: its optimal activity against ssDNA comes when it participates in a complex with two proteins, the F-encoded TraY, and the host-encoded integration host factor (IHF). TraY and IHF both bind DNA sequences proximal to the TraI nicking site. Following DNA nicking (and cross-linking of TraI to ssDNA), ssDNA transfer is delayed until a signal indicating formation of a stable mating complex is received. Responding to this signal, the TraI molecule, in an effort that requires its helicase activity, is transported into the recipient and circularizes the transferred plasmid by reversing the initial transesterification reaction. We have shown that the TraI relaxase domain binds ssDNA with exquisite sequence specificity, and havedescribed the structural basis for this specificity. The TraI helicase also binds ssDNA. Recently we discovered that these two sites, which can bind ssDNA with similar affinities, compete for ssDNA, withbinding to one site preventing binding to the second. We believe that this characteristic plays an essential role in regulating the activities of TraI during transfer. Using a combination of NMR, X-ray crystallography, small-angle X-ray scattering and small-angle neutron scattering, we are working toward a structural model of the intact TraI protein. 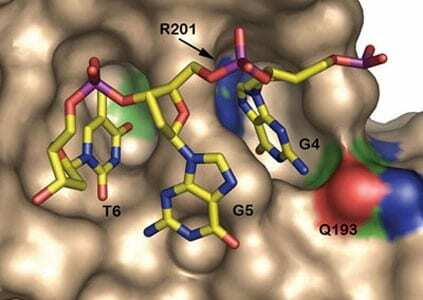 Using biochemical approaches, we are characterizing the helicase binding site and searching for the basis of the competition between binding sites. The F TraI relaxase domain structure (top) reveals that ssDNA sequence specificity can be partially attributed to bases docking into pockets in the binding cleft (bottom). We can measure the efficiency of the transfer process, and thus the effect of Tra protein variants, by assessing the frequency with which a genetic marker (for example, an antibiotic resistance gene) moves from one bacterial strain to another. The transfer process, however, is complex, involving many steps. We can therefore determine that transfer has been impaired, but we have a much harder time determining at which step transfer is impaired. To counter this shortcoming, we are collaborating with the lab of Professor Jie Xiao to refine methods of observing the proteins and process of transfer as conjugation occurs. Although plasmids are sometimes mistakenly thought of as bacterial excess baggage, plasmids have co-evolved with their harboring strain, making the plasmid an integral part of the organism. There are reports that pathogenic bacterial strains harboring F-like plasmids can lose virulence when certain of the F-like genes are disrupted. What is the basis of this loss of virulence? We are starting to explore the interactions between host and plasmid that can affect the pathogen. Dostál L, Schildbach JF (2010) Single-stranded DNA binding by F TraI relaxase and helicase domains is coordinately regulated. J. Bacteriol. 192, 3620-8. Anderson BJ, Larkin C, Guja K, Schildbach JF (2008) Using fluorophore-labeled oligonucleotides to measure affinities of protein-DNA interactions. Methods Enzymol. 450, 253-72. Hekman K, Guja K, Larkin C, Schildbach JF (2008) An intrastrand three-DNA-base interaction is a key specificity determinant of F transfer initiation and of F TraI relaxase DNA recognition and cleavage. Nucl. Acids Res. 36, 4564-72. Larkin C, Haft RJ, Harley MJ, Traxler B, Schildbach JF. (2007) Roles of active site residues and the HUH motif of the F plasmid TraI relaxase. J. Biol Chem. 282, 33707-13. Williams SL, Schildbach JF. (2007) TraY and integration host factor oriT binding sites and F conjugal transfer: sequence variations, but not altered spacing, are tolerated. J Bacteriol. 189, 3813-23. Williams SL, Schildbach JF. (2006) Examination of an inverted repeat within the F factor origin of transfer: context dependence of F TraI relaxase DNA specificity. Nucleic Acids Res. 34, 426-35. Larkin C, Datta S, Harley MJ, Anderson BJ, Ebie A, Hargreaves V, Schildbach JF. (2005) Inter- and intramolecular determinants of the specificity of single-stranded DNA binding and cleavage by the F factor relaxase. Structure (Camb). 13, 1533-44. Stern JC, Anderson BJ, Owens TJ, Schildbach JF. Energetics of the sequence-specific binding of single-stranded DNA by the F factor relaxase domain. J. Biol. Chem. 2004 279, 29155-9. Datta S, Larkin C, Schildbach JF. Structural Insights into Single-Stranded DNA Binding and Cleavage by F Factor TraI. Structure (Camb). 11, 1369-79. Harley MJ, Schildbach JF. (2003) Swapping single-stranded DNA sequence specificities of relaxases from conjugative plasmids F and R100. Proc. Natl. Acad. Sci. U.S.A. 100, 11243-8. Larkin C, Datta S, Nezami A, Dohm JA, Schildbach JF. 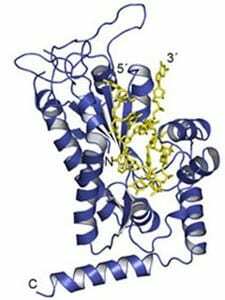 (2003) Crystallization and preliminary X-ray characterization of the relaxase domain of F factor TraI. Acta Crystallogr D Biol Crystallogr. 59:1514-6. Street LM, Harley MJ, Stern JC, Larkin C, Williams SL, Miller DL, Dohm JA, Rodgers ME, Schildbach JF. (2003) Subdomain organization and catalytic residues of the F factor TraI relaxase domain. Biochim Biophys Acta. 1646, 86-99. Lum PL, Rodgers ME, Schildbach JF. (2002) TraY DNA recognition of its two F factor binding sites. J. Mol. Biol. 321, 563-78. Stern, J.C., and Schildbach, J. F. (2001) DNA Recognition by F Factor TraI36; Highly Sequence-specific Binding of Ý Single-Stranded DNA. Biochemistry. 40, 11586-95. Lum, P. L. & Schildbach, J.F. (1999) Specific DNA Recognition by F Factor TraY Involves Beta Sheet Residues. J. Biol. Chem. 274, 19644-58. Schildbach, J.F., Karzai, A. W., Raumann, B.E., & Sauer, R.T. (1999) Origins of DNA-binding Specificity: Role of protein contacts with the DNA backbone. Proc. Natl. Acad. Sci. U.S.A. 96, 811-7. Pamela Lum, currently a Professor at the College of Southern Nevada. Matt Harley, currently a science teacher at the Harker School. Jenn Stern, currently a clinical research study manager at Amgen. Dana Miller, currently an Assistant Professor of Biochemistry at Univ. of Washington School of Medicine. Chris Larkin, currently a Microbiologist, CBER, Food and Drug Administration. Kip Guja (M.S. ), currently M.D./Ph.D. student at the Stony Brook University School of Medicine.